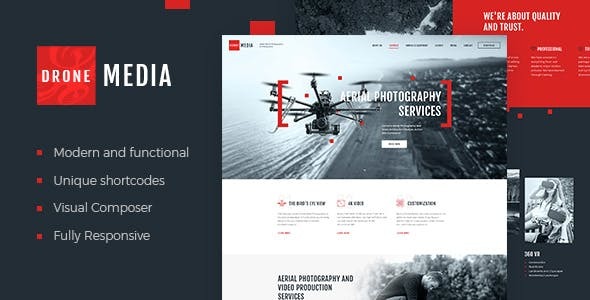 Drone Media is a new, fresh, stylish & trendy WordPress theme. It is focused on aerial photography and videography. The design has modern touch and feel, and it offers full pack of options to describe your services and expose all your projects. It is perfect for those who deal with photo shooting, video recording, event agency with camera operator services. It works for both corporate business & private organization. Drone Media is 100% responsive and fully editable. Whatever you feel like changing – here’s an easy-to-use admin panel to your access, with its handy Customizer. Want to get the demo just like ours? – simply use one-click demo installation option, and there you go! Any issue occurred – you’ll be helped within hours. - Theme options on custome post types are fixed. - Woocommerce shop buttons are added. - The button close modal window is moved.